A guide for graduating students in high school or colleges seeking to get hired in the Philippines Call Center Business Process Outsourcing industry. If you are new and have no clue on what to expect, this article can serve as a reference for first timers and also those who continually to fail the job process. The BPO (Business Process Outsourcing) industry in the Philippines has the most substantial contribution to economic growth with average salaries surpassing other professional jobs, it is the most preferred career sought-after by graduating students. Most graduating classes these days have at least 50% of graduates starting in the call center industry, regardless of the course they completed. Recently, there is even a trend of employees studying part time and completing college with the help of their call center salaries. However, even though the call center industry are constantly hiring there are those who find it hard to pass the initial job process with a staggering estimated figure of 80%-90% fail rate. This guide is broken down into steps and sections for easier reading and understanding. It aims to get you walking into a recruitment center looking for a job, and walking out hired with a contract. A word of caution when a first time job seeker applying for a BPO job coming across the term “one day processing”, it might seem that getting a contract on the day that you applied is a bogus claim, however most call center companies boast “one day process”, which states that within the day you will know the results of your application and not the contract signing. Make sure you clarify this when you first apply at any BPO company, most HR team will give you an honest answer on the job process stages. The term “one day processing”, literally means “a day or within 24 hours”. 1. Walk into the recruitment office in the morning – or better yet, as soon as the office opens. 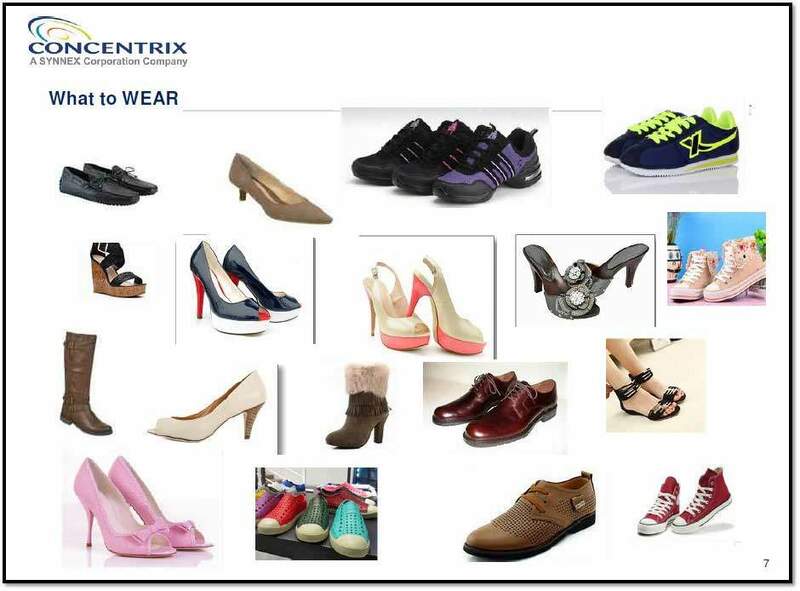 Here in Exprosearch Recruitment we have several stages – from the initial profiling, interview training and vocal coaching which can last for several hours, going into the intial interview, endorsement, deploy onsite, exams, and final interviews – and applicants are processed on a “first come first served” basis. If you want to be hired within the day – then you gotta show up early – or you have to queue in the waiting area. 2. Be prepared by bringing the following items with you: additional copies of your cv/resume, valid identifications, cell phone, pens, and a bottle of drinking water. Never assume the HR team has copies of your resume since you sent it by email or you gave a copy to the front desk receptionist, that no one will ask for another copy. In reality most people in HR are handling thousands of applications weekly, there is a high chance that your paperwork may get lost – even if you are already queued for a final interview. In case this happens, you should retain a copy of your resume for yourself – as it will come in handy during interviews. You will need to fill out an application form at the front desk or reception, or to complete a test – at the very least, you need a pen to write your name in an Applicant Logbook. Have a backup pen, for extra security. Be mentally prepared, it’s going to be a long day, and not all recruitment centers have refreshments or a water cooler to keep you hydrated. The last thing you want to be is dizzy and distracted during an interview or a test. Don’t worry applicants will be given breaks but don’t expect more than one for a quick lunch. 3. 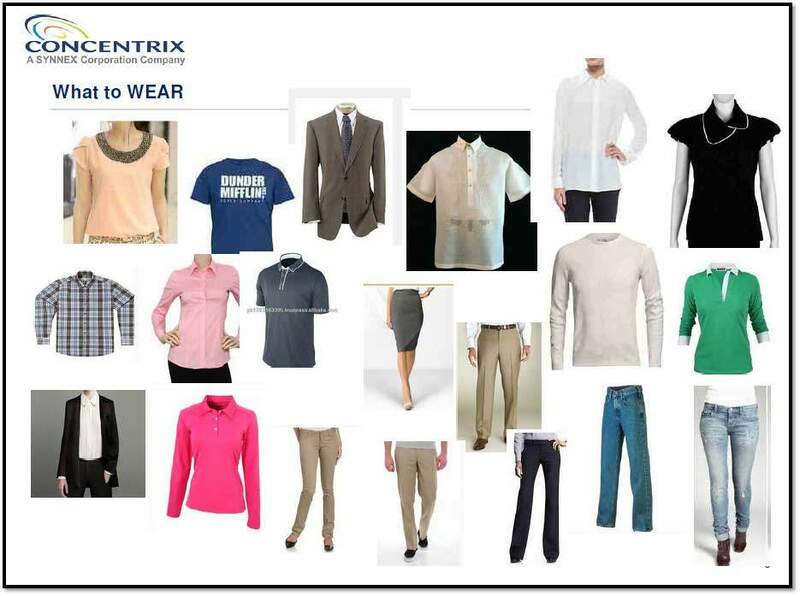 Always dress for success, applicants who are in business casual clothes have an edge over people who come in wearing a t-shirt and jeans. Not only does it demonstrate that you respect the company by showing up in appropriate attire, but it also tells the interviewer that you do have “business casual” clothes to wear during client visits. 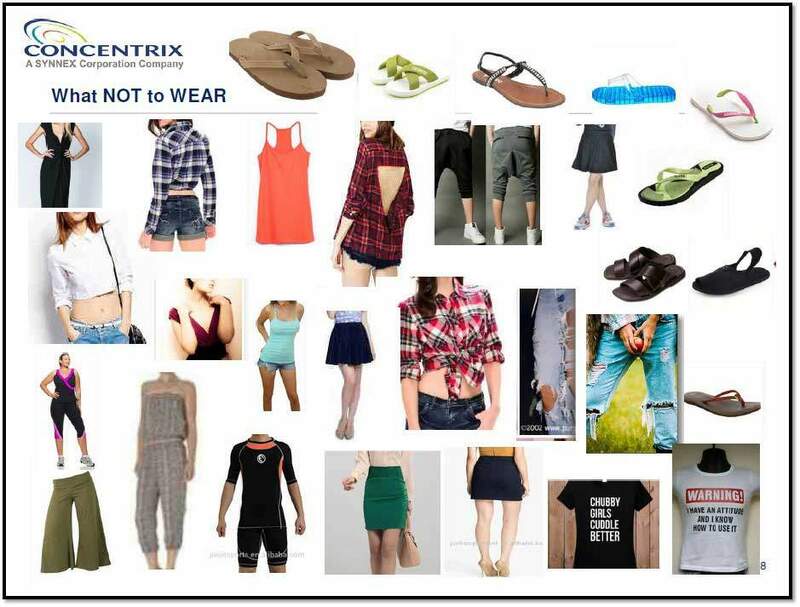 Here are recent examples of dress codes from Concentrix sent to us to screen candidates, make sure you are not wearing the blacklisted clothes! 1. Remember the correct details in your resume. The initial interview will only be for screening purposes , which means they want to know the details of what you put in your resume. Eg: You were working for McDonald’s for how many months? You graduated on what date? You changed your course, when? Attention to details like these, they will nit pick to see if you are making false claims. Even if interviewers have this information in front of them in paper – they will still ask you these questions: partly to warm you up, also to get a clearer picture of your skills, and partly to see if you pay attention to details. So if you’re not clear on the dates or lengths of time that you had done or completed something in your resume, you will either be scrambling your memory for the answer, or even ask to take a little peek at your resume to check the answer. Here’s the trick: This is best why having multiple copies of your resume while being interviewed, so that you can take a quick glance down to help your memory. Still, the operative word is “HELP” or resume on hand is just to help your joggle your memory. If you have to bury your face in the paper looking for an answer every time you are asked a question, then obviously you don’t even know the contents of your own resume. 2. Answer interview questions directly and simply – meaning, you don’t have to spout your life story to the recruiter when they ask you something simple like: How did you learn about our job opening? The larger call center companies have in-house HR or Recruitment Specialists grouped into teams. Teams have a scorecard – which means that a team will have a quota or goal of successful hires to fill seats in a campaign or account. There will be even greater pressure for recruiters to fill those seats as fast as they can when a campaign or account is “ramping up”. So, cheeky and rude responses are unappreciated by strict interviewers. They have a roomful of people to process! Help them make their jobs easier. 3. In your interviews and personal assessments always show that you are a team player, because when you do get hired you will become part of a team. Similar job description to the recruitment team that hired you – you will have a scorecard made up of your goals, quotas, and statistical performance. Your individual performance will be averaged with the rest of your team co-workers data. Incentives are usually given by team performance, so you have to show that you can get along with all types of people and personalities. Do you get along well with new/different/difficult people? What do you see yourself doing 5 or 10 years from now? They may not word it exactly as above, but they will ask variations of the same questions, or even give you a scenario where they are actually asking the questions above. Just keep in mind that you always have to be prepared to have an answer on your time management skills, your conflict resolution skills, and on your plan or goal in life. Q: How do you handle your time? A: I plan forward so that even if I have an emergency it won’t have an effect on my schedule, as a result of I’m ready with a backup plan. Q: Do you get along with completely different personalities? A: I believe being open to all points of view is necessary. So instead of focusing on differences, I try to find a method where everybody can win. Q: What do you see your self doing 5 or 10 years from now? A: I wish to develop and learn in one company, so I will work hard and climb the leadership ladder. 1. The account or campaign you are applying for will determine the type of tests you take. An advert that is looking for an “Inbound Customer Care Agent for a Telco Account” will look into your verbal, comprehension, and computer skills – as you will most likely be doing problem solving, or explaining charges on phone and internet services. An advert for a “Financial Account” will, of course, look into your math skills and your awareness of financial instruments such as: mortgages, stocks, bonds, forex etc. An advert for an “Outbound Sales Agent” or “Telemarketer” will look into your personality – which will be determined by either the results of your personality exam, or your interviews – as successful sales people are self-driven to reach their quotas. 2. Remember the aptitude exams you took in school? This is when it becomes handy, usually will be given to first time candidates into the call center industry. So until you have a good history of experiences then you’ll most likely be asked to go through these tests. The tests usually consist of: grammar, reading comprehension, basic math, non-verbal logic, and personality. Calm your nerves during the exam, it’s best to be mentally prepared for the time pressure needed to answer 50 questions or more. Practice on your exam taking skills by timing yourself while doing one of those free online aptitude tests. 3. Call center work always revolves around computers, so your typing speed will most likely be tested. Most accounts or campaigns are satisfied with 45 WPM (Words per Minute). Take an online typing test so that you know your WPM, and practice until you get a solid score. 4. When you have to go through a verbal or oral test, give priority to pronunciation and enunciation over speed. Most people think that talking faster will show how smart they are, however, what is more important to the interviewer is how you will be understood by foreign customers – especially, over the phone. This is why some interviews or tests are done over a simulated phone call, as this is to determine how a customer will hear you. They may ask you to do something as simple as counting numbers (1, 2, 3…) or reciting the alphabet (A, B, C…) – don’t mumble through the numbers or letters like you are singing the forgotten words on the karaoke song. Call center agents most repeated task are number crunching, such as: account numbers, confirmation numbers, repair ticket numbers etc. So it is vital that the interviewer will not hear your local filipino accent and hear the difference in clear neutral English between an “F” and an “S” or a “B” and a “D”. 5. Since communication is a two-way process, the other counterpart that is just as important to the verbal test is the listening comprehension test. You may be asked to listen to a recording wearing a headset, or to someone speaking over the phone. They will most likely ask you to write down details of what is being recited or spoken. For example: “Hi, I’m Mr. Smith, I would like to make a dispute about my latest bill on the previous month of March, It is showing a $245 charge when my plan is only $79 and I don’t remember what it was for. Could you help me out? I think it was for my mobile plan broadband or something. Anyway, my account number is 24160527”. The keywords in the script above are: Mr. Smith, March, dispute, $245, mobile broadband, account number 24160527. You will learn quickly when you are used to handling the different types of foreign accents, It’s also smart to familiarize yourself with different accents, so watch TV shows or English movies that feature characters with non-neutral accents, such as characters with a Texan accent, a New Jersey accent, or an Aussie and British accents. 1. The complete cycle of the hiring process can be as short as a few hours to as long as a whole week depending on the company and also account. Expect to do at least 2 interviews: the initial interview and the final interview, however this depends on the account or campaign that you are being endorsed in. Sometimes, there may be as many as 5 interviews, wherein the interviewers get higher and higher in position, or at some point you may be speaking to a foreigner either through a conference call, or face to face. This is actually a good thing, because the higher the person you are talking to the better the position you are being considered for. So stay calm if they make you stay even into the late evening (around 9-10 PM), and I suggest that you prioritize completing the recruitment cycle in one go, instead of rescheduling because you’re exhausted or you have other plans. There are tons of other people more than willing to take your spot and if you give up your spot in the line, the next person might get the job instead of you. 2. The people who do the final interviews are more than likely the people that you are going to directly work for when you do get hired. The final interview may be conducted by your future supervisor, or operations manager, or even a group interview of all the main officers of the account or campaign that is hiring. They may even be foreigners – and if this is so, then you might be in good luck and get a spot on a new account that is about to launch. If that’s the case, and you are within the first “waves” or batches of agents, then you have a better opportunity to go up the ladder, if it’s a promotion that you’re aiming for. 3. To sum up the last item, it is most likely that you are talking to your future boss. Think about it: you’re gonna be working for this guy/girl in the future, so how are you gonna make them like you? Do I boast about myself so that I could impress him/her? Do I butter him up to boost his/her ego? Restrain yourself from overreacting and being fake, because you might come across as a know-it-all-backstabber. A call center supervisor has simple needs, they need agents on their team who: will come to work on time; will come back from breaks in time, will not take a lot of unplanned days off; and who can get along with all kinds of people. In other words, you want to show that you are reliable, likeable, and cooperative. The great thing about “one-day processing” is that you know your fate by the end of the day. You either walk in looking for a job and walk out with one, or even if you don’t get hired on the spot, then at least you’re not left hanging in suspense wondering if you should be looking for other employment opportunities. One thing that unsuccessful applicants can do is to ask the recruitment team that processed them for feedback. Then you would know at what point in the process that you need improvement on: typing speed, How to improve your English grammar etc. Most recruiters I have encountered are willing to give you feedback when nicely asked, but if they are reluctant to give you this information then don’t be pushy – remember it was a long day for them too!